At every award show, there seems to be one speech that stands out among the others. And while every recipient is overcome with emotion when they’re accepting their awards, there was one actress at this year’s Emmy Awards who delivered a noteworthy acceptance speech. Enter Viola Davis, who made history at the Sept. 20 award show by becoming the first African-American to win an Emmy for best actress in a drama. As if winning weren’t enough to seal her place in history, she proceeded to deliver perhaps one of the most touching and inspirational speeches not only of the night, but also in Emmys history. Transcript via The New York Times. Davis’ speech spoke to the importance of her winning the award, while also pointing out the trailblazers that have cleared a path for actresses like her to have a chance for success in the industry. She also acknowledged her fellow actresses who help to further the prospects of future generations of women and women of color. 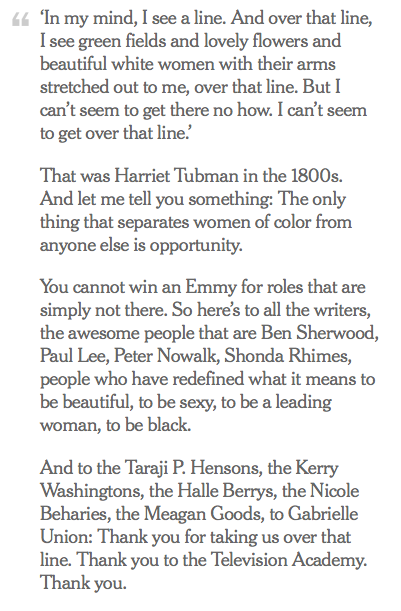 There was no better way to cap off the Emmys than with this speech. And what was equally touching about her win was that when Davis’ name was called, her fellow nominees were just as excited for her as they would be if they had won. Couple this with her speech, and we are dealt two major takeaways from this one moment: that success is possible despite the restrictions societies and industries may place on women and women of color, and that it is more than possible for women to support their peers in their successes. While we can watch award shows idly and comment on the fashion, it is a moment like this that makes award shows worth watching; here, we not only celebrate the success of a talented actress, but we received a speech that will inspire countless young women across the country and around the world to fearlessly and passionately pursue their dreams. Somewhere, a little girl was watching Davis win that award. And what she saw was more than an actress in a pretty dress receiving a trophy — she saw a woman who has transcended barriers to achieve her dreams. She heard a speech that not only recognized the hurdles Davis overcame, she heard her graciously celebrate her peers. She saw that dreams do come true, and Davis’s Emmys win may be just the thing that inspires this little girl to go after her own dreams without fearing societal barriers and racial or gender restrictions. While Davis expressed her gratitude in her Emmys acceptance speech, we — the women of the world who watched with pride — want to thank you, Viola Davis, for being an inspiration to us all.